On 18APR Holland America Line celebrated 145 years of existence. "This organization began by transporting people from Europe to the United States," said President Orlando Ashford, kicking off a recent press event on the Eurodam. Ashford connected that initial purpose with the role Holland America Line plays today in connecting people from different cultures. He shared an anecdote about a recent personal experience. 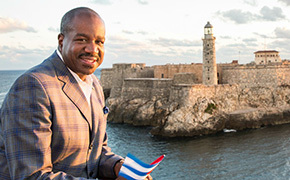 "On the 28th of December, for the first time in over 30 years, we had a chance to take a cruise ship into Cuba," said Ashford. "I brought my parents and my aunt and uncle as well as my own family." Ashford's parents had never cruised before. "My parents like to stay pretty close to the house, so it was a big deal for us to get them onto the cruise ship," he explained. "My Dad wasn't really excited about being on a ship, but he was going because his wife was going." Ashford continued that his dad is a man of few words: "On the third day of the cruise, he leans over to me, whispers in my ear, and says, 'You know, boy, I could do this again.' This translates to: 'This is the most amazing thing I've ever had in my life. I love it. I'll do this over again.'" His anecdote is telling. Cruising creates a connection to a destination, and Ashford noted that Holland America Line reaches close to 500 destinations worldwide. Ashford continued, "Our cruise then called in Cienfuegos, on the other side of the country from Havana." He described Cienfuegos as being a very artistic town and that led to the second connection: "My wife Samantha and I like to collect art. We were in this Cuban artist's home/studio, and there's art all over the walls. We started looking and found a piece that we liked. "Then we did that thing that we all do when we're travelling--we start huddling together to see how much local currency we have so we can pool it and maybe buy this piece." The artist saw them doing this. "She told us, 'Don't worry, pick anything you want," recalled Ashford. "'You can take it with you. I know you'll send me the money.'" Ashford then told the audience that he had travelled and bought things all over the world, and, "I've never had a vendor do that. I looked at her inquisitively and she says, 'No, I've been doing this for a long time, and I can read people. When I tell you I've been doing this, I've only had one person not send me the money. Take anything you want.'" Thanks to that personal connection of trust, Ashford said, "I have a lot of Cuban art in my house right now."